Mathecia wants to be closer! The birth of Dr. Isomorpheus! Oh, sweet! It has been a year! Seems like yesterday, though! Happy Birthday, Dr. Isomorpheus! I never knew we will come this far: 129 comics, 3600+ readers on Facebook, 3 exhibition stalls, 1 newspaper interview and several mentions on social media. Dr. Isomorpheus wasn’t started to inspire people to do math. It may or may not have done it, it may do it in the future, but it wasn’t meant to do so. It was a just-for-fun activity. On a hot April 2013 afternoon, I finally opened the comic making website – Pixton, which Nishika had been asking me to look at. I signed up, logged in, learnt about making comics and created a character that looked like me. I had to make a comic now. Purely by chance (non-uniform randomness), I decided to make a math comic. Ofcourse, my love towards mathematics provided an inclination to do so. I picked up a popular joke and made “Dr. Isomorpheus and 9D!”. I showed the comic to Nishika, got a positive response and published it on my personal profile. Very soon, I had a dozen comics on my profile but the response was mixed. Nishika asked me to make a page for these comics so that I could get a bigger audience. On May 20, 2013, I made the page and got Nishika onboard because she had been a constant supporter of the comics. I had no clue about how she would have been able to help me. Very soon, she started showing her skills in making new jokes, creating new designs, making posters, bringing in new ideas, The Mathalympics and everything you need in a creative team-mate. 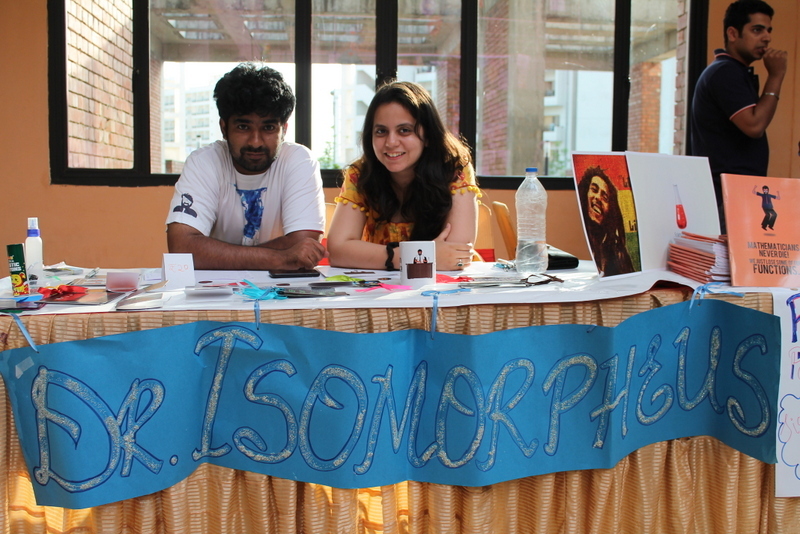 I was happy as I saw Dr. Isomorpheus by Hitesh Gakhar becoming Dr. Isomorpheus by Hitesh Gakhar and Nishika Bhatia. We teamed up exactly a year back and we are still going strong. There are lots of things we have planned for near and distant future which includes seminars in high schools, making animation movies, lecture series, comic books, etc. Keep following and sharing! The name “Dr. Isomorpheus” was coined by Hitesh while making a gag for something else a month before the first comic. Isomorpheus was derived from Morpheus from the movie- Matrix. Epsilly was created a year before Dr. Isomorpheus by Nishika for her mathematics newsletter- Mathletics. The most liked comic on facebook is “Dr. 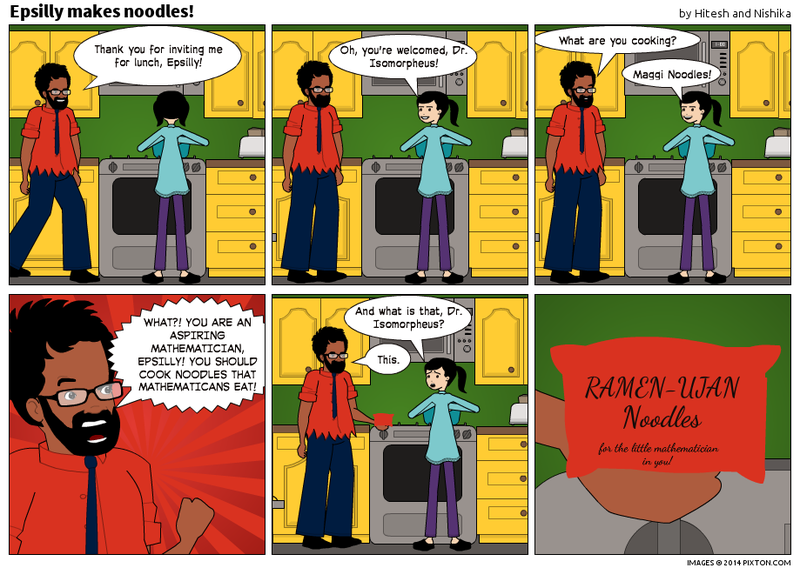 Isomorpheus goes shopping!” with 231 likes. Our major promotions/helps in the beginning were by Urban Fictionary and Bhak Sala. 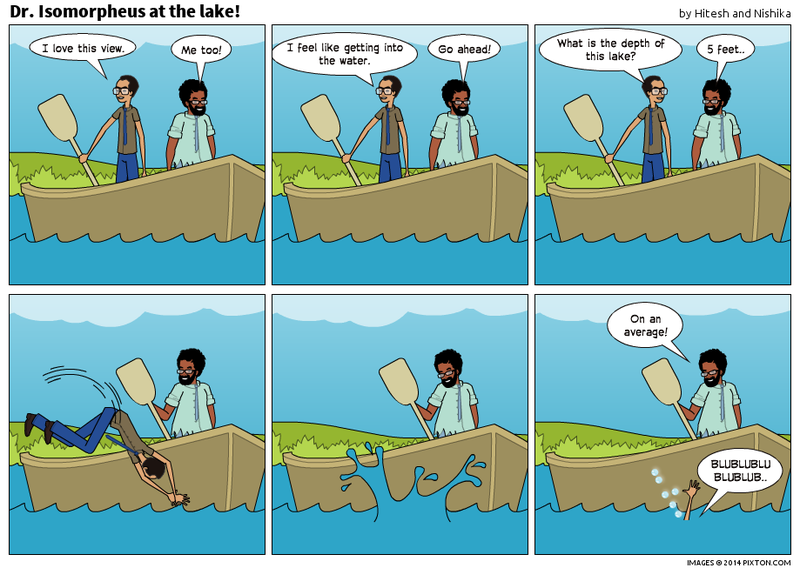 Dr. Isomorpheus is India’s first mathematics webcomic series.